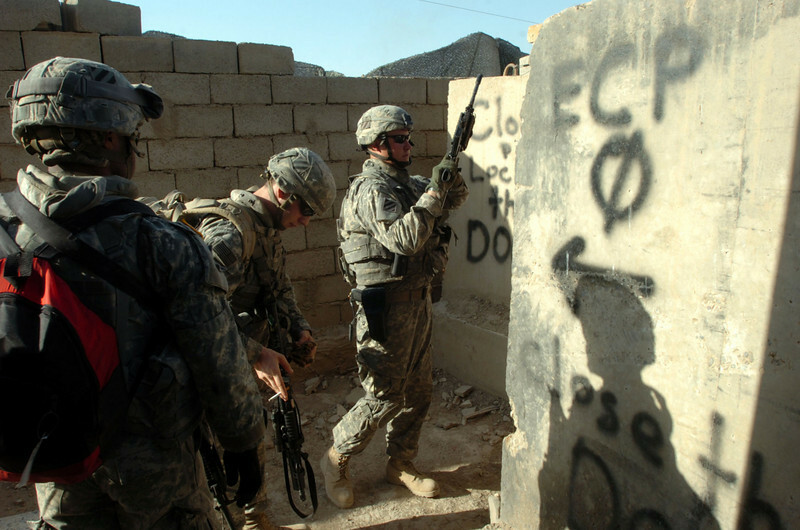 Soldiers prepare to leave Combat Outpost Grant for a morning patrol of the Hay al Adel neighborhood of Ramadi. 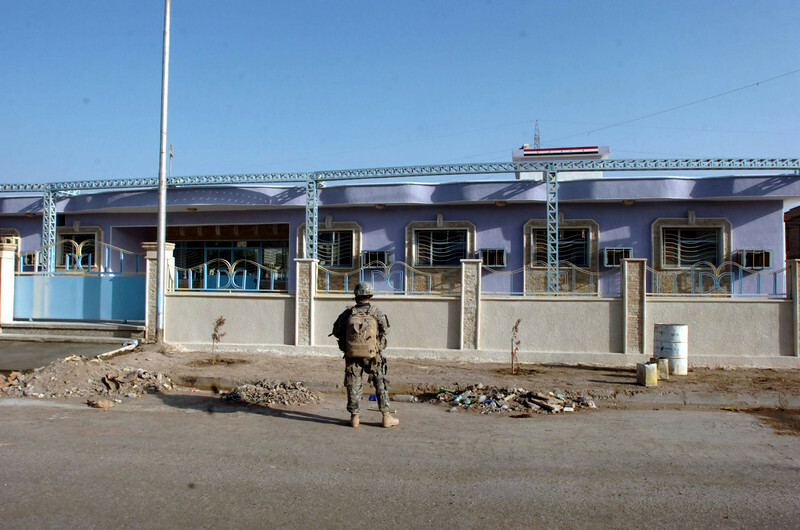 A soldier pauses in front of the recently renovated medical center in Hay al Adel. 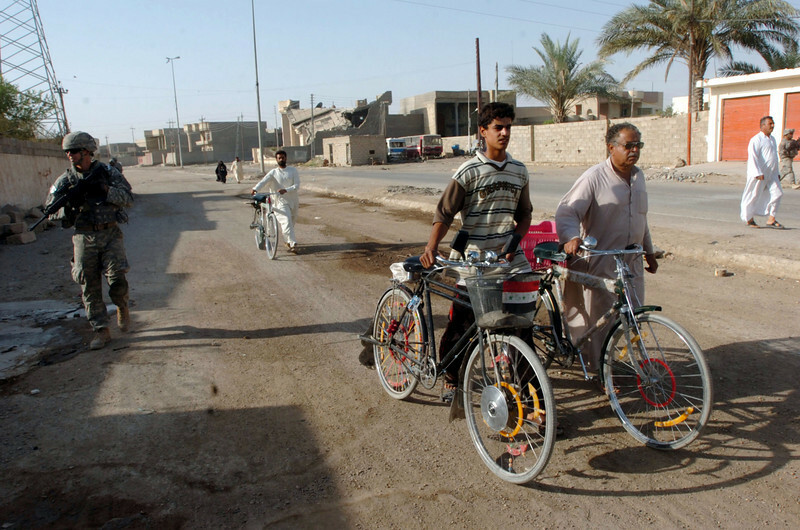 Iraqi nationals walk their bicycles past the patrol. 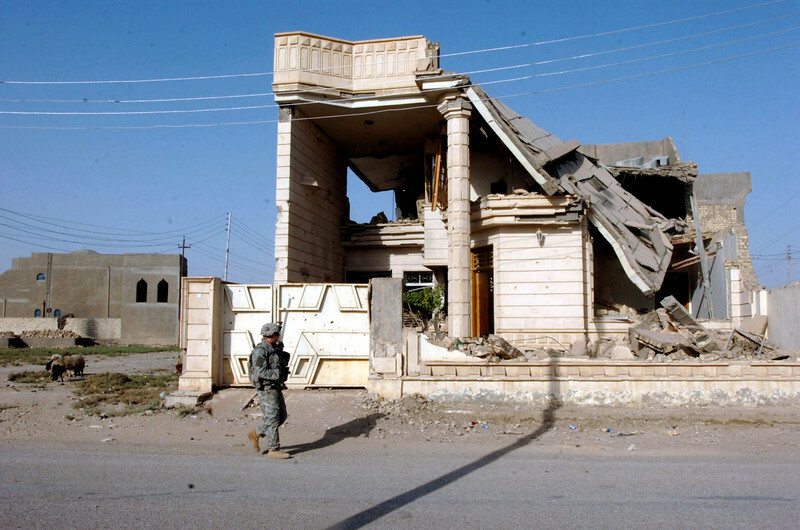 A soldier walks past a house destroyed during the insurgency in Ramadi. 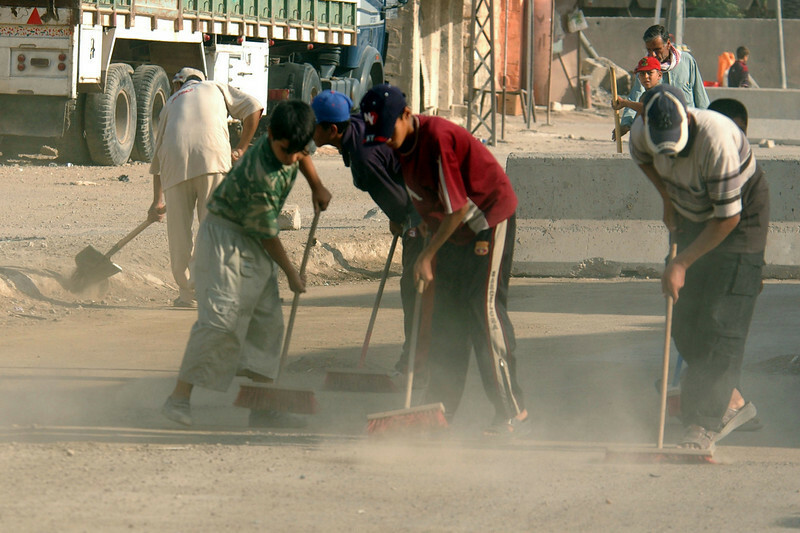 Cleaning up the Hay al Adel neighborhood begins with the youth sweeping the streets. 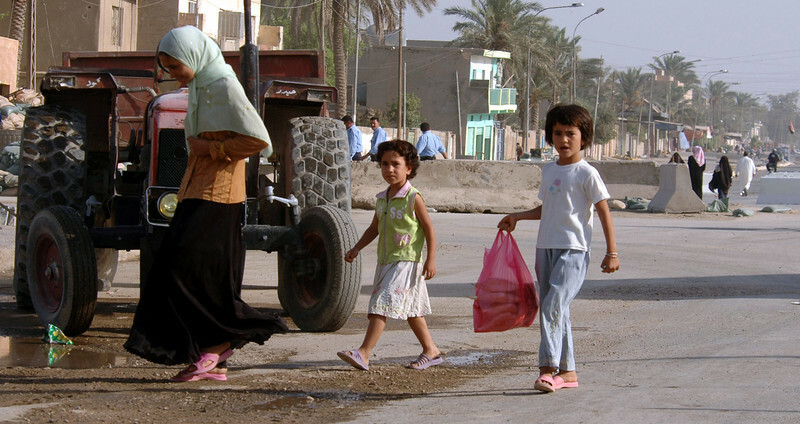 Children go home after going to the local market. 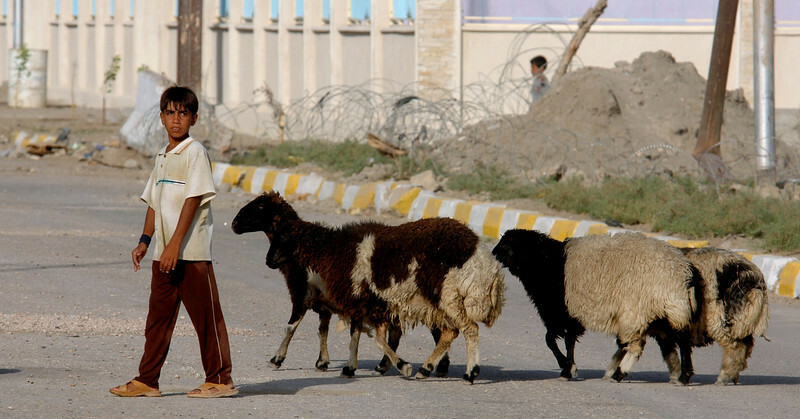 A young shepherd leads his flock of sheep to better pastures in the Hay al Adel neighborhood of Ramadi. 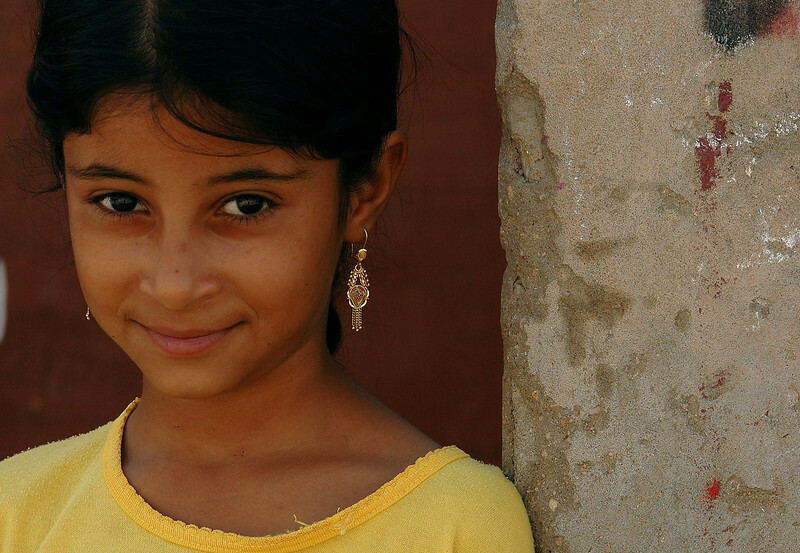 It's an effort to bridge cultural differences and build trust among the children and the adults. 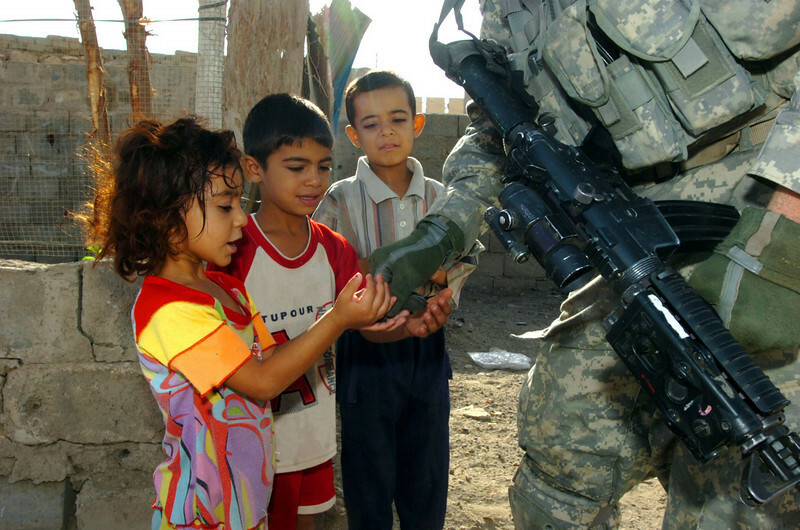 Iraqi children know how to put the pinch on soldiers for candy. 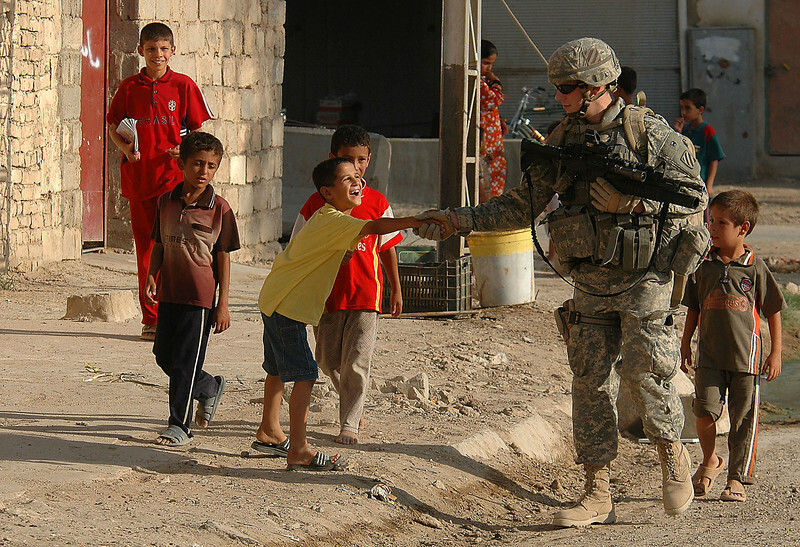 A young girl smiles after getting a lollipop from soldiers passing by her home. 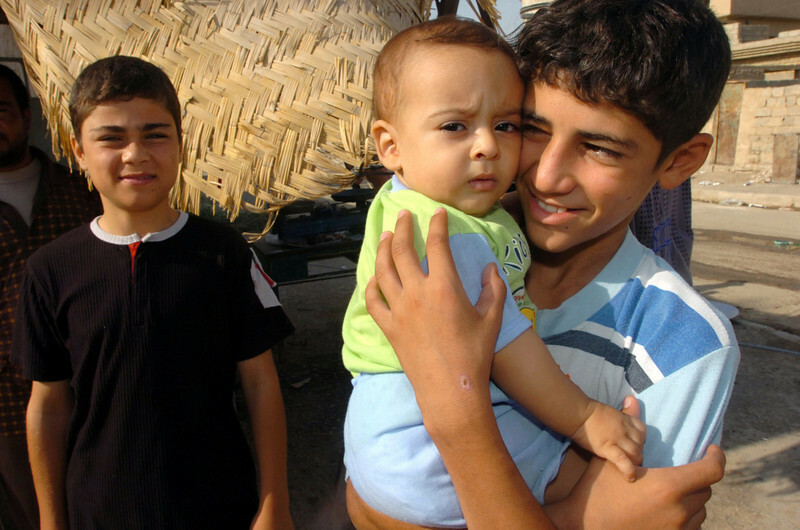 Children come out for candy and want to have their photograph taken. 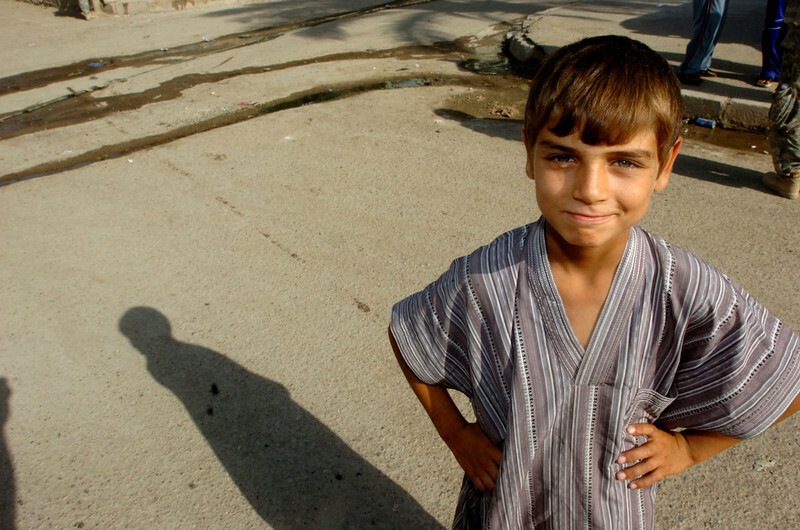 An impish, young boy assumes an unabashed posture as he waits for his photograph to be taken. 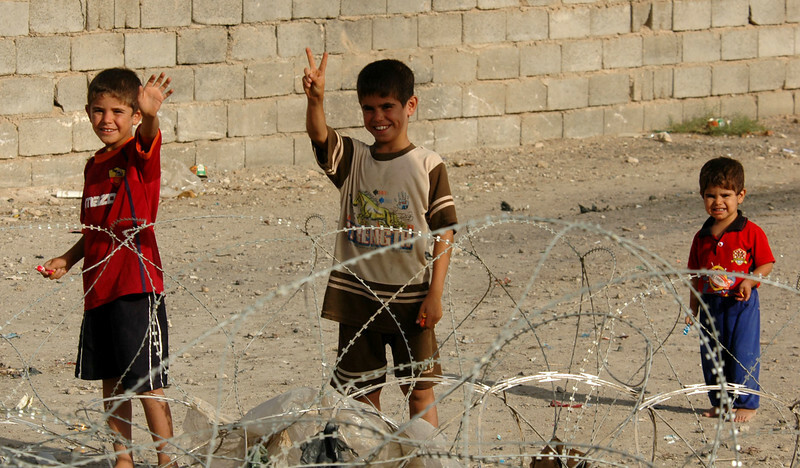 Three boys wave to the soldiers behind a roll of concertina. 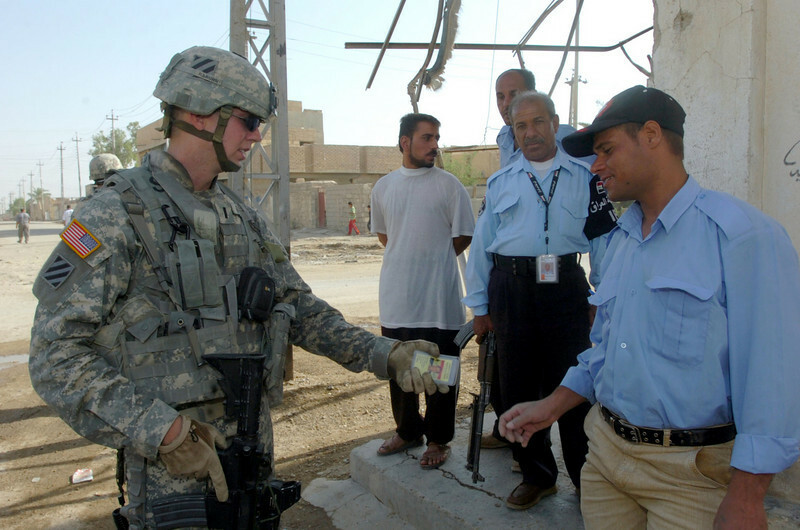 1st Lt. Chad Raburn checks the ids of a group of neighborhood security volunteers on a corner in the neighborhood market area. 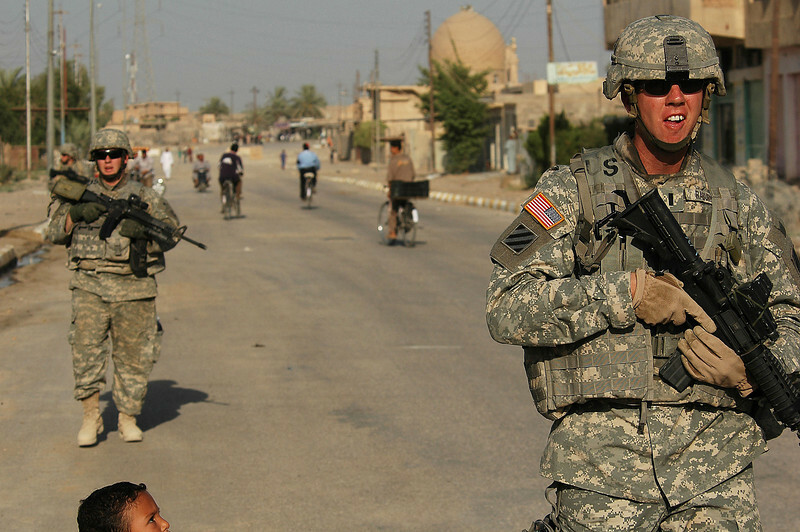 Some are shy and stand off, away from the patrol of soldiers, hoping to be given a piece of candy. 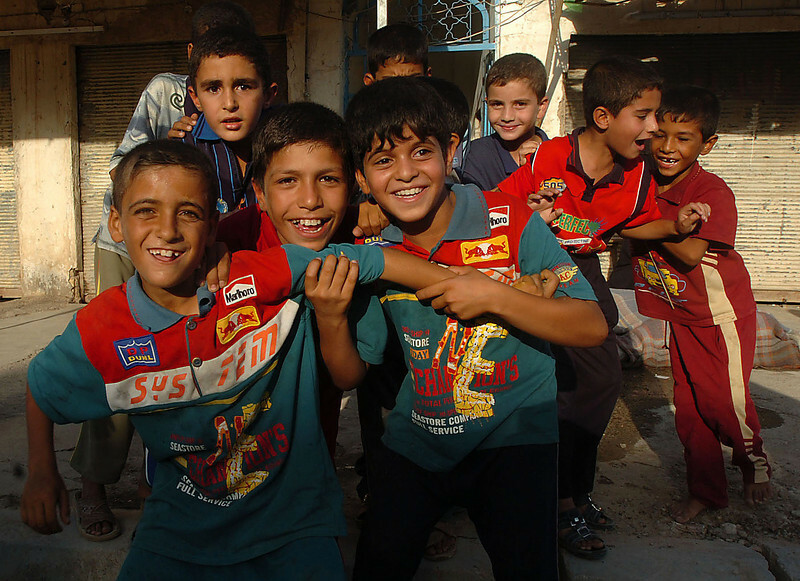 A winsome smile and deep, trusting eyes, the future of Iraq. 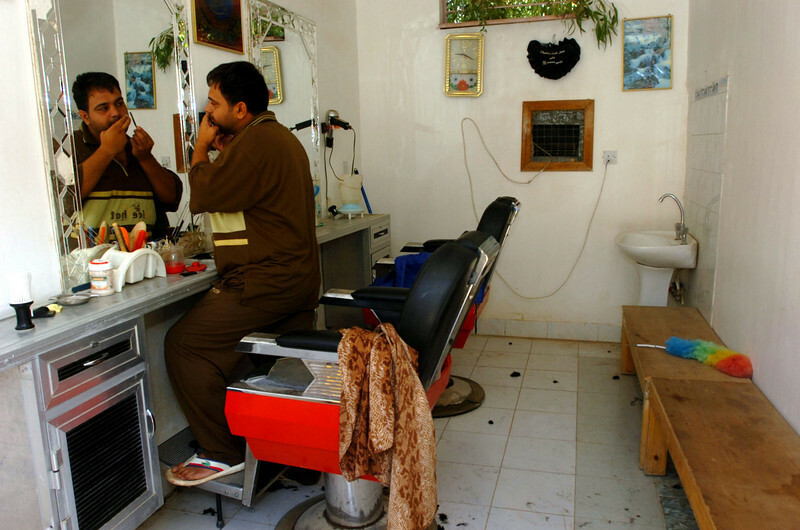 A barber gives himself a trim after opening his shop Saturday morning. 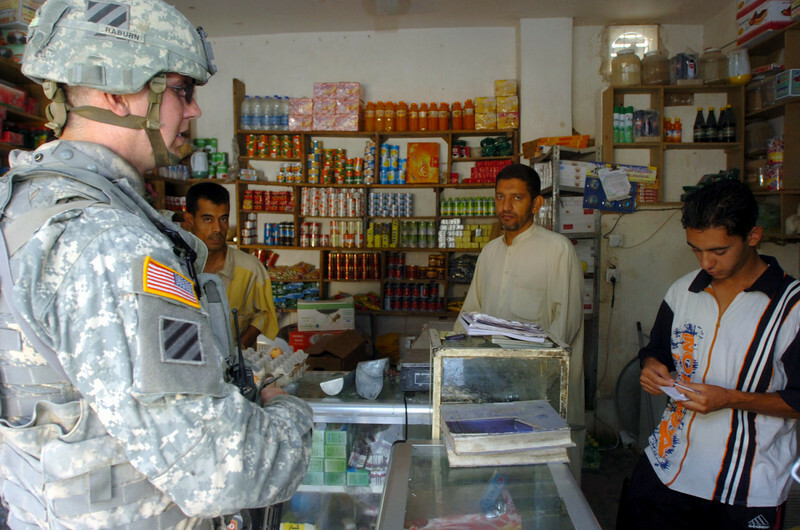 1st Lt. Chad Raburn stops in a shop looking for something to buy. 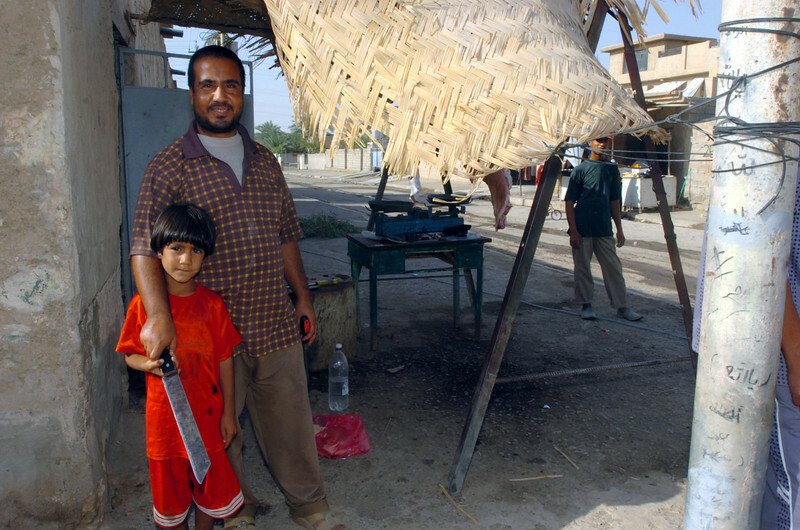 A butcher pauses from his work to pose with his son. 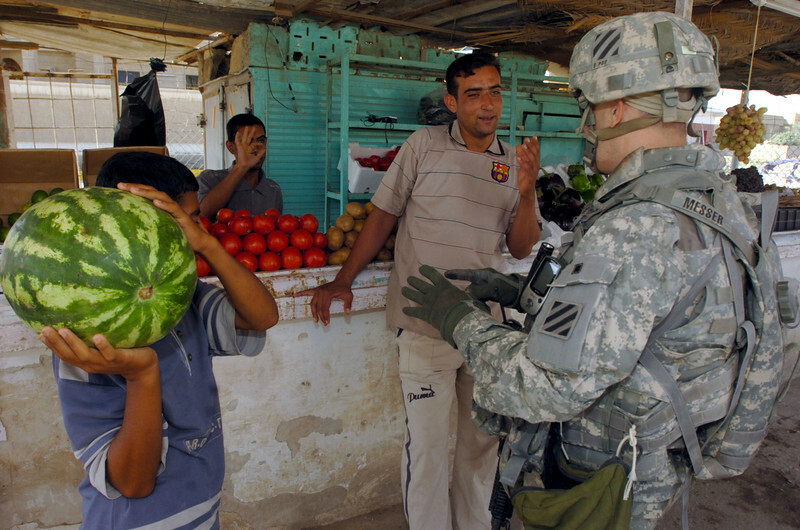 Captain Phil Messer negotiates the price of a watermelon during Saturday's morning patrol. 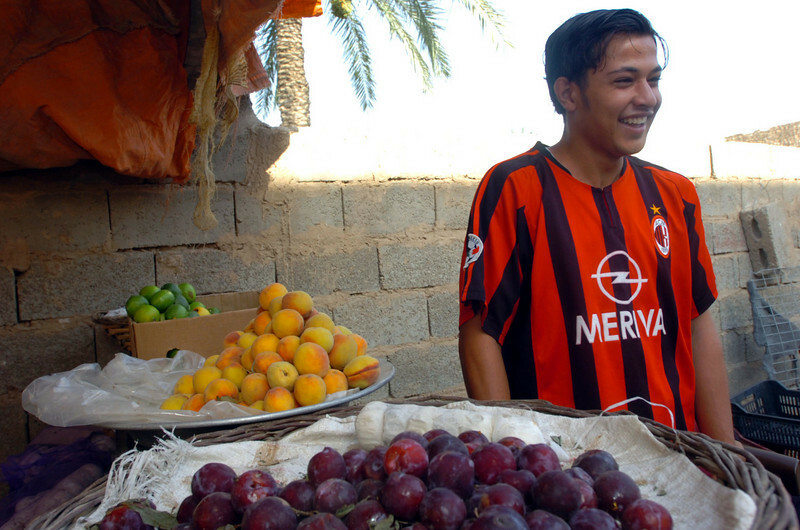 The market vendors have reopened their small shops in the neighborhood. 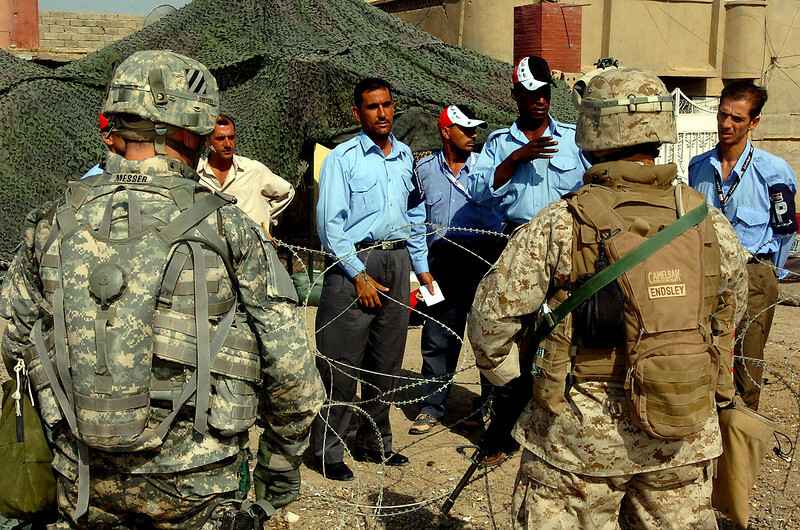 Meeting with Iraqi Security Forces and discussing a recent shooting directed at the combat outpost. 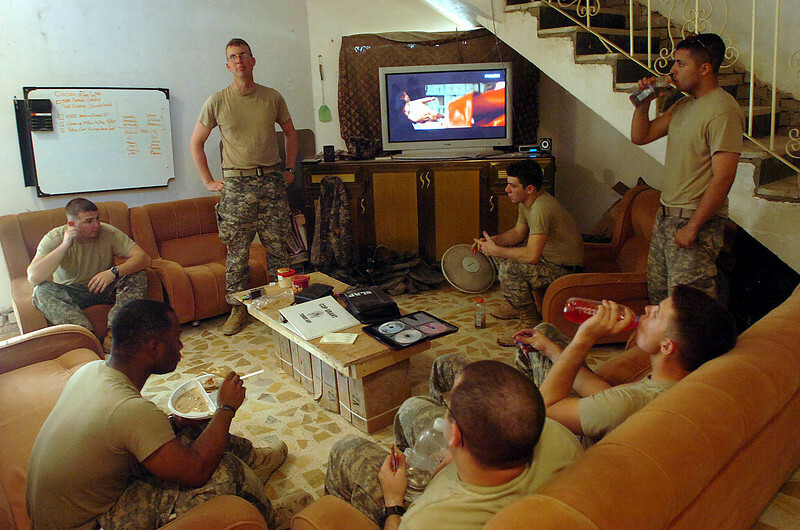 1st Lt Chad Raburn leads a briefing following the morning patrol of Hay al Adel in the living room of Combat Outpost Grant. 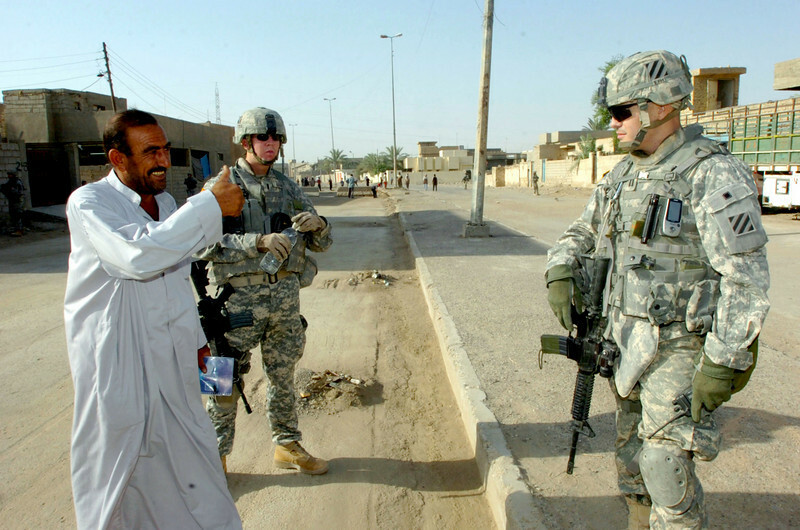 Back on the streets of Hal al Adel during early evening patrol. 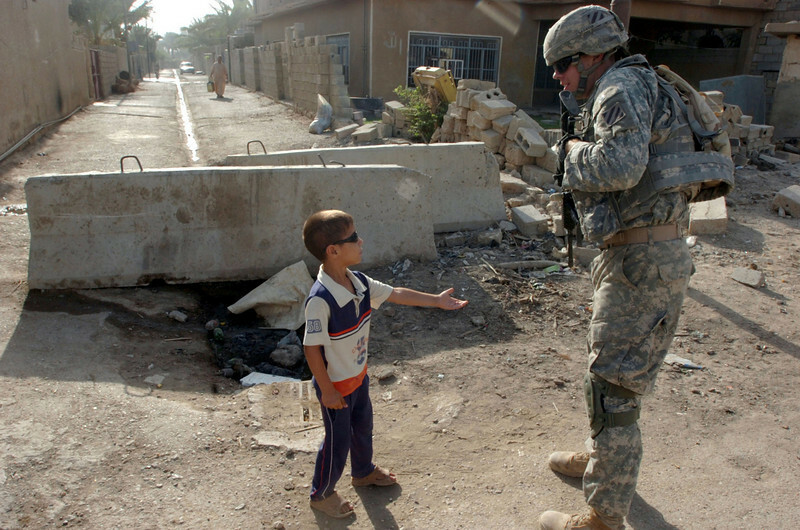 On evening patrol in Hay al Adel, a soldier shakes the hand of a young boy. 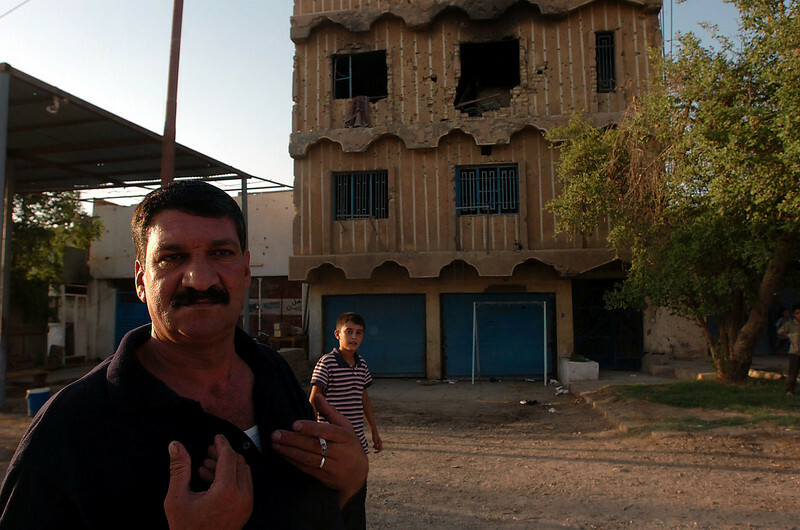 A father with his son watches the eveing patrol walk through his neighborhood. 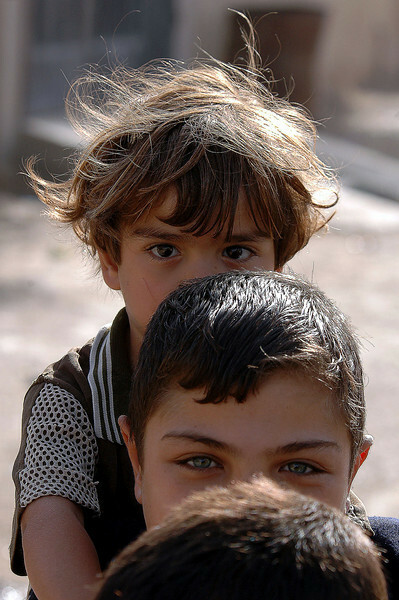 Always eager to mug for the camera these boys crowd and push to have their photograph taken. 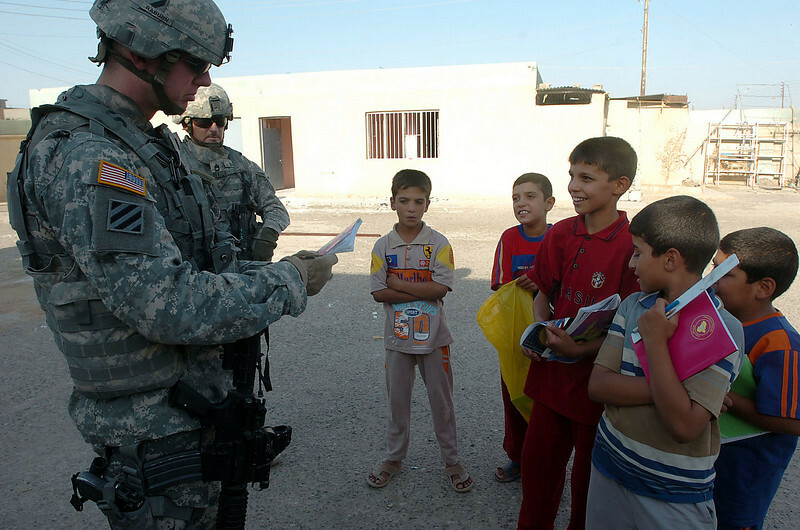 1st Lt Chad Raburn looks at a school boy's work book in the schoolyard. 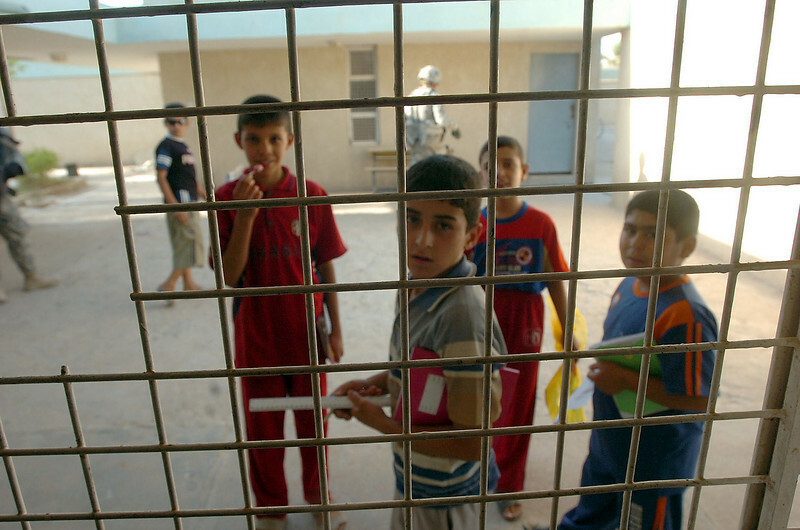 The boys were eager to practice their English language skills with the soldiers. 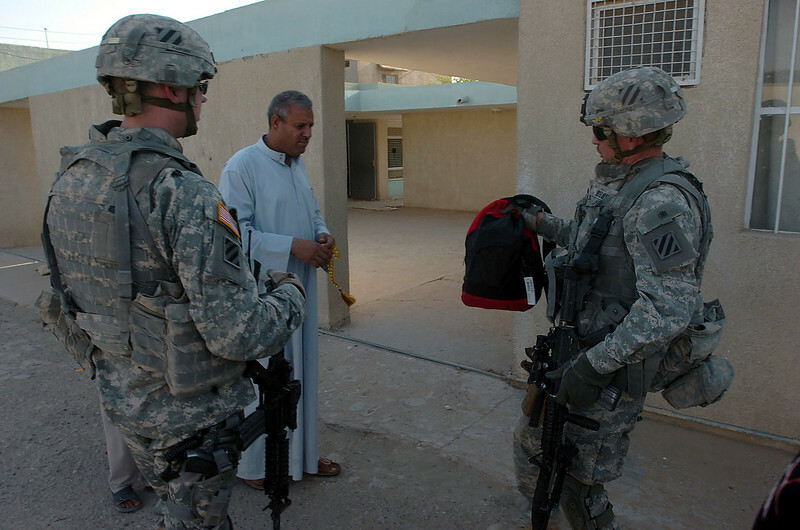 During the early evening patrol the soldiers stop by to donate school supplies to the principal. Inside a classroom looking out into the open patio. 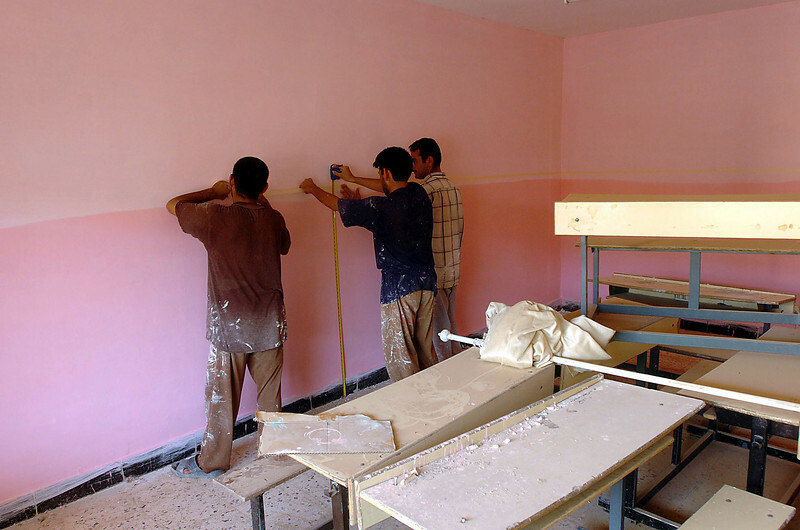 Getting classrooms ready for the school year, these men are painting one of the classrooms. 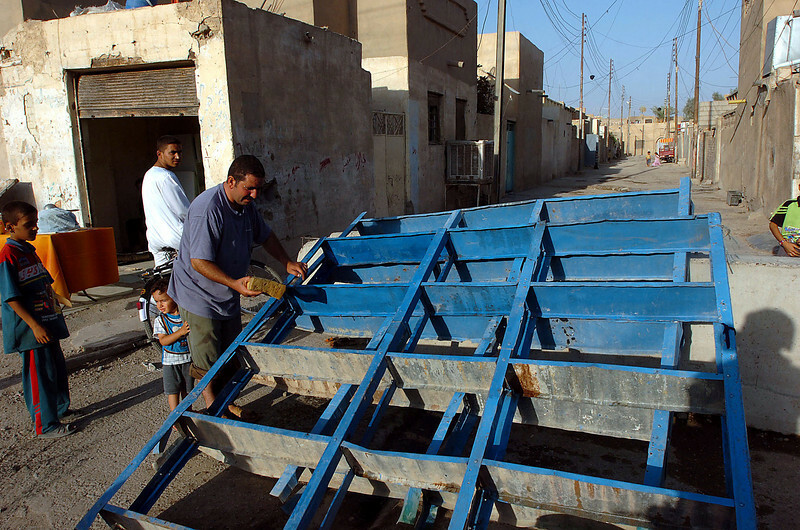 Reconstruction continues in the Hay al Adel neighborhood of Ramadi, as this man preps and paints shelves to re-open his shop. 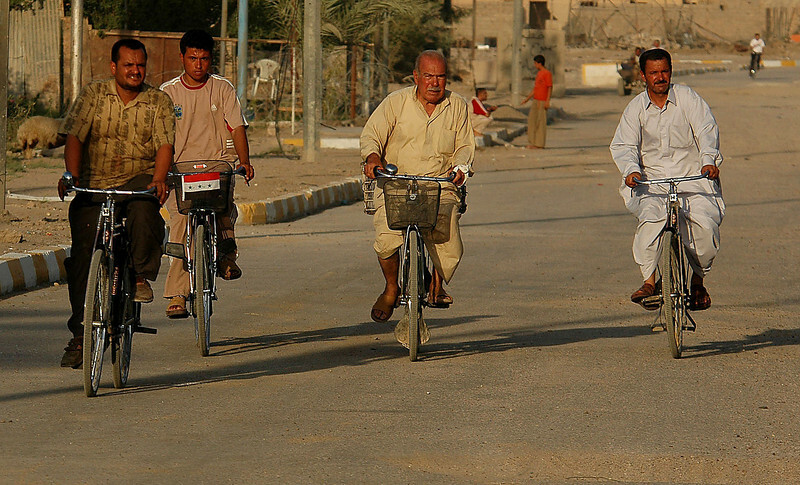 Four men riding their bikes in the early evening approach the patrol, the elderly man, second from right, shouted an exuberant, "Thank you," to the soldiers as they rode by. 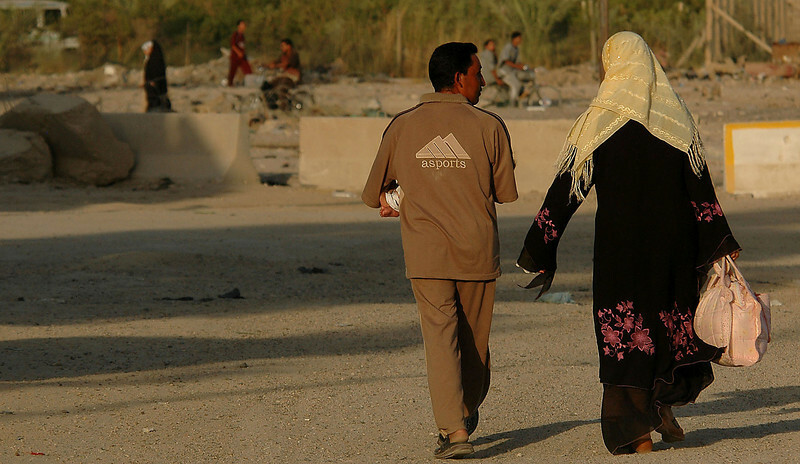 An Iraqi couple walk home in the early evening light after completing their shopping in Hay al Adel. 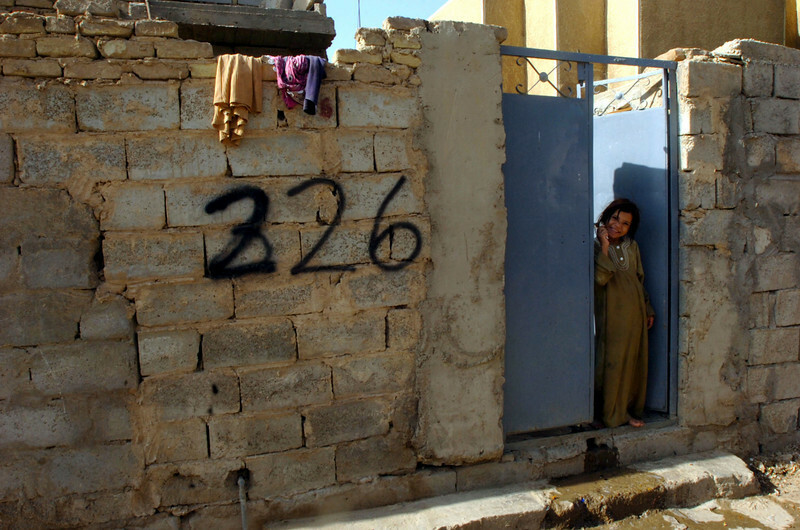 "Two years, two years," this disgruntled Iraqi man said, gesturing towards his scarred and bullet-riddled home, as the patrol walked past.